Bad bugs are a fact of life on the organic farm. My favorite method of insect control is avoidance, which is our new technique for combatting the squash vine borer this year. We love summer squash, but the yellow zucchini varieties we'd been growing were magnets for the borer. After reading that vine borers tend to skip yellow crookneck plantings, we decided to give this new variety a shot, and sure enough, I saw the vine borers pass through the garden but only found one damaged stem and none of the squash plants wilted. 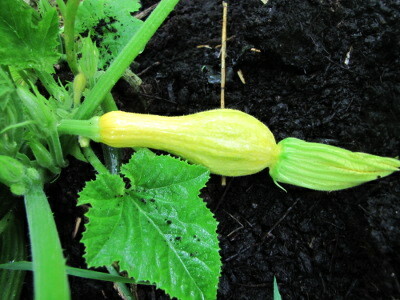 The only downside is that I'd planned for our summer squash to die young like it does every other year, so I succession planted --- we may soon be swimming in summer squash. You can avoid insects with timing as well as with variety selection. 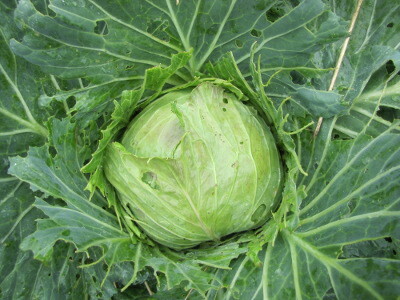 Most years, I manage to get the broccoli in the ground early enough that I've got all of the heads processed by the time the cabbage whites start fluttering through the garden to lay their eggs, so I barely have to deal with cabbage worms. This year, the spring ground was so cold that my broccoli and cabbage ran a week late, and we ended up with lots of damage. I've resolved that if the soil temperature is too low to plant my spring crucifers on time next year, I'll start them indoors so that I can avoid those pesky caterpillars. If I can't avoid them, my next line of defense is hand-picking. Just fill a cup with water and flick or drop the insects in --- they'll be too busy staying afloat to fly away. If you're picking chicken-approved insects (everything except asparagus beetles and stinkbugs in our garden), pour the contents of the bug cup into the pasture and your insects will quickly be converted into eggs. If your chickens won't eat them, you can always just put a lid on the picking container and let the bad bugs drown. The new trick I've discovered this year about hand-picking is to hit the insects hard as soon as they appear. In 2010, I dutifully squashed asparagus beetles once a week, but there always seemed to be more to pluck. This year, when the first beetles arrived, I picked them immediately and kept checking on the plants at least once a day until I no longer saw adults. Then I squashed the few larvae that got past my first round of control three times a week until they were also gone. 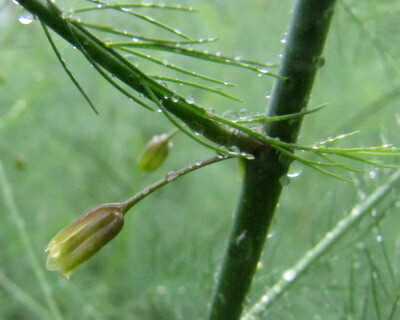 By the time the asparagus ferns were fully leafed out and impossible to check for bugs, the asparagus beetle had been eradicated! Even though it felt like I was spending more time picking bugs than in previous years, I was able to stop after just a few weeks, so my total bug-picking hours for the year were actually fewer. In the end, most of my insect control methods come down to timing, which is why I'm careful to mark emergence dates on my calendar and cruise past problem plants daily when insects are due to arrive. In a temperate climate, winter does a remarkably good job of knocking insect populations back; my job is just to follow along in the footsteps of cold weather and make sure the insects stay down. Yet another reason I'm glad I don't live in the tropics. Our chicken waterer solves another homesteading problem --- poop-filled waterers. Any truth to the tale that squashing snails causes them to hatch eggs? I hadn't ever heard that, so I don't know the answer to your question. We don't have trouble with snails here --- we keep the plants in the sun and rarely see snails. When I do, I either leave them alone (some are just debris eaters and won't hurt your plants), or snag them for the chickens, who love them. I figure the shells are free calcium for the flock! Good timing on your post... I think my cukes just got hit with the squash vine borers, I have several leaves dying (over the past several days) but not the whole plant. Is it too late to spray Bt or something at this point? I had given up on them once I figured it was the vine borers. I could be wrong, but I doubt you've got the vine borer in your cucumbers. They generally leave cucumbers and melons alone because the stems of these plants are more solid and harder to deal with. What's more likely is a fungus or virus --- we generally lose our cucumbers in short order to mildews. Has it been wet where you live? I try to plant my cucumbers in a very sunny spot so they dry off quickly after a rain, and I put new seeds in the ground every two weeks until mid summer so that I can keep harvesting even when the old plants die off. Some folks spray the leaves with milk or other substances, but succession planting and using resistant varieties has been the most helpful for me. After those green worms ate our kale last year (ugh!) I made sure to sprinkle cayenne pepper after every rain. No worms so far! For some reason, I find it easier to hand pick than to remember to scatter any kind of repellant after every rain. Maybe just because it rains so much here?